Great inspiration from ‘Bad Birdwatching’ | What More Can There Be? 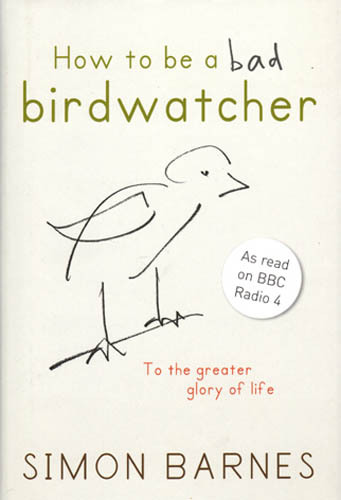 When Simon Barnes wrote ‘How to be a Bad Birdwatcher’ he produced an excellent introduction to bird watching. It has also become one of my all time inspirational books. No, no, bear with me here, let me explain. As usual I was an hour early for a meeting and was therefore killing time in a bookshop. 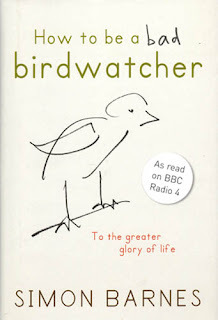 As I perused the titles, occasionally skimming their contents, I came across an unassuming book with a line drawing of a bird on the front; its title ‘How to be a Bad Birdwatcher’. I had no interest in birdwatching so only gave it a cursory glance. As I continued to browse, for some reason this dismissive act bothered me and I went back and took it off the shelf for a second time. A moment of epiphany? Not quite! I rationalised that having no interest whatsoever in birdwatching I couldn’t justify spending the cover price and left the shop. But, it continued bothering me. In fact it bothered me for two weeks until one Saturday I made a special trip to a bookshop and purposefully sought out this mysterious tome. As I left with my copy I couldn’t understand why I felt so compelled to buy this book. The upshot is that it is a great book about birdwatching and as I sit here typing this blog I keep glancing out of the window, looking for unusual ornithological passers-by. This hasn’t changed my life… honestly! The tenet of the book is that all around us are birds. How often do we notice them? They’re always there and easy to spot. The point is how often we fail to notice them. Most people will go through their day without noticing the birds around them. This created one of those great analogies. Ideas are the same. We are often blind to that great idea which can make our lives, nay, everyone’s lives better. How often do they flit into view but we don’t notice them? What if like me, you walked with your head up looking for ideas to come into view. You became like the bad birdwatcher – someone who enjoys observing whatever comes your way. You never know what inspiration that might bring. This entry was posted in Change on February 1, 2011 by dave5621.